Is urban agriculture an appropriate use of city parks? This is a question we'll hear more often in coming years, as interest in urban farming grows, and advocates try to identify open lands within city limits. I have advocated for it in the past, writing about urban ag in parks here. Several months ago, at the Mayor's Forum on Urban Agriculture in San Francisco, an audience member asked the candidates about the potential for farming in Golden Gate Park. The subsequent debate got me thinking a little more deeply about the issue. Several of the candidate's responded categorically that farming should not be allowed in the park, citing the park's Master Plan. And I for one agree. But let's start at the beginning. 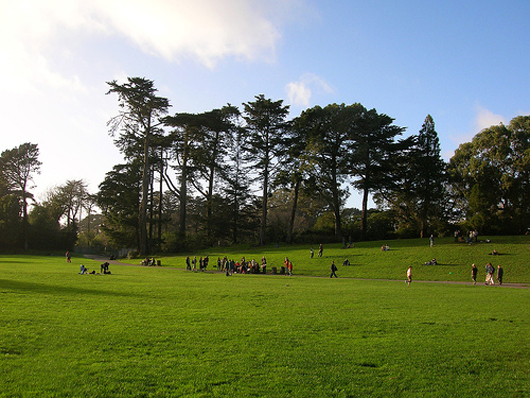 It is sometimes erroneously believed that Golden Gate (GG) Park was designed by Frederick Law Olmstead, the famous designer of New York's Central Park. By the time Olmsted was asked to design GG Park, he had turned away from the idea of a singular large park, and his suggestion to San Francisco was a chain of smaller parks, similar to the Emerald Necklace in Boston. His recommendation was rejected, in favor of the Central Park model, and the park we have today was designed by William Hammond Hall and later John Mc Laren. Both men agreed with Olmstead's naturalistic prefernces, feeling a park should be a place apart from the city, where people could enjoy 'nature'. William Hammond Hall is quoted as defending the open spaces, saying "The value of a park consists of its being a park, and not a catch-all for almost anything which misguided people may wish in it." 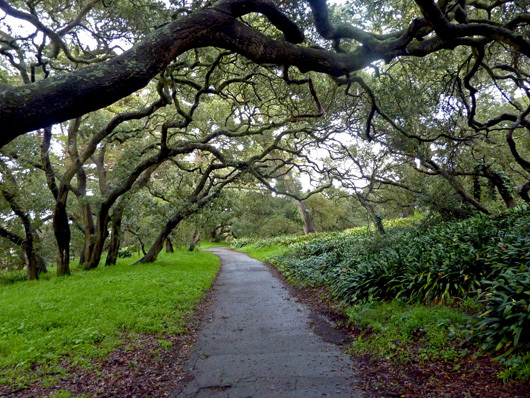 Today Golden Gate Park is largely naturalistic, composed of bold, expansive areas of tree groves and rolling meadows. The fact that it is completely artificial does not reduce the benefit, or draw, of spending time in an open naturalistic area, and it's popularity is clear on days with nice weather. Too often the art behind a successful natural park design is invisible to the public, which assumes the land was simply never developed. So when many of the candidates argued against farming in the park they were essentially declaring that as a landmark design of landscape architecture, the park should be left alone, and the original design intent respected without meddling. I was happy to see recognition of the art of landscape architecture, and a respect for works of the past. For one thing, as a city, we have found it acceptable to include many small landscape 'improvements' to the original Master Plan. The Rose Garden. The Memorial Rhododendron Garden. The Peacemakers Garden. The Conservatory of Flowers Garden. In fact, the entire eastern third of the park is littered with 'improvements' and hardly a stroll in nature at all. For another thing, there is a tradition of great public gardens with community gardens and farms. Olmsted's own Emerald Necklace features a 7-acre community garden, placed there during World War II. Many public parks in Paris feature community vineyards, and apiaries, and create community events around the wine making and honey gathering. Given this, perhaps a small urban farm or community garden would not be totally out of character in the park after all. It seems the most appropriate site for farming in the park would be an acre or two in the eastern end of the park, where the naturalistic setting has already been populated with other programs. Or, a less popular solution, we could free the buffalo to roam in Yellowstone with their brethren, and make better use of their paddock than animal enclosure for illusory illustrations of the Old West. Locating urban agriculture near the park's entrance would serve as a symbol of the City's commitment to sustainable agriculture. It would also be a destination, and tours and workshops, along with other programs, could be integrated into the working of the farm. So it would fit, but is it a good idea? One obstacle to farming the park is the weather. Most edible crops like sunshine, and San Francisco's climate would suggest locating farmland east of Divisadero, out of the fog belt, in more reliably sunny areas. Take it from a Richmond gardener, a fog farm is fairly limited! Another reason its not ideal is demographics. If we are talking about a community garden, why locate it in an area of the city well served by gardens, where most residents have backyards? Why not look to areas like SOMA and Bayview where residents are underserved by parks of any sort, and have no access to backyards? I'd love to see an integrated parks plan, that would take agriculture into account, along with other open space needs, and distribute it equitably across the City. So where does all this rambling leave us? I don't think urban agriculture can be ruled out completely from Golden Gate Park, just as I don't think grabbing every bit of 'unused' land in the park to transform into crops would be right either. 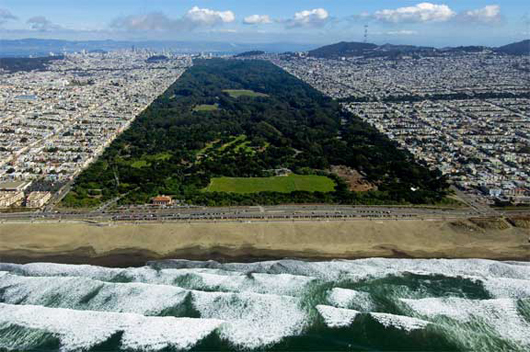 Golden Gate Park is a strange target though, and other parks might make better candidates. Parks are designed to serve people, and as people's needs change, so too should the parks. But carefully, so we don't lose what cannot be replaced. Like any effort to balance preservation and development, it's a complicated issue - if you have thoughts, I'd love to hear them.